A fair few years ago I was at a workshop that had just been taken over by a new proprietor. I’d known the new bloke for some time and so when I drew him aside and asked how he’d found his new facility and staff, he was frank. "Hell," he said. "These guys don’t even have a vacuum gauge, let alone know how to use it!" I looked around at the dyno and the fuel pressure measuring gear, at the air/fuel ratio meter and the multitudinous tools. How could a plain ol’ vacuum gauge hope to compete in this environment, I thought. 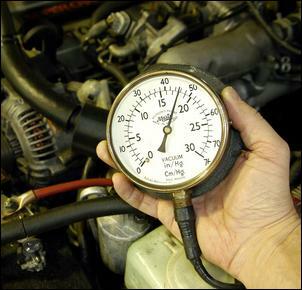 But that mechanic was right: when trying to diagnose mechanical engine problems, a vacuum gauge is right up there with other diagnostic tools. So how can measuring engine vacuum tell you anything? When the engine is working at less than wide-open throttle, vacuum – or a pressure lower than atmospheric – occurs after the throttle. So when it’s sitting there idling, the engine is trying to draw in as much air as you’d expect from a big air pump, but the nearly closed throttle is actually restricting the flow to just a trickle. As a result, after the throttle there exists a vacuum. Think about it for a moment and you can see that the better the air pump (ie engine) is working, the higher will be the vacuum reading. Or, to put it another way, if the pistons rings are leaking badly, the engine will be trying to draw in less air than it should – so the vacuum won’t be as strong. Any vacuum gauge that reads up to 30 inches of mercury will be fine in this application. (Note that we’re using Imperial measurements right through this article.) This gauge was picked up secondhand for a few dollars – it’s since had the glass cleaned and the brass surround polished... about 15 minutes of work. 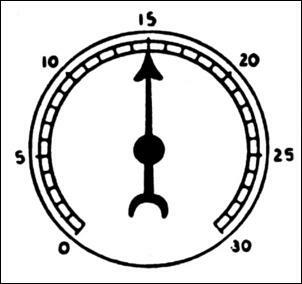 It’s important to realise that while a vacuum gauge shows how much below atmospheric pressure the reading is, the gauge will read higher for a higher vacuum. 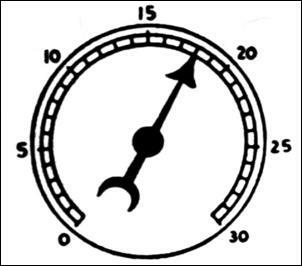 That is, on the face of the vacuum gauge, the needle will point higher for 25 inches of mercury than it will at 20 inches, of mercury, even though 25 is a lower pressure than 20! 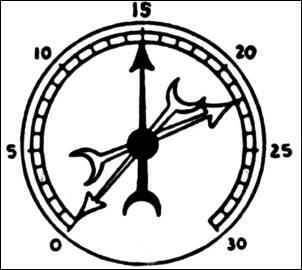 In some cases, especially with engines with a small number of cylinders and/or a small plenum, the gauge may dance too much as rapid fluctuations in plenum pressure affect the reading. In these cases the hose can be pinched a little to dampen the plenum pressure pulses. There’s engine vacuum – and then there’s engine vacuum. When measuring engine vacuum for diagnostics, it’s important that you tap into the plenum chamber rather than on the throttle body itself. In some cases, throttle body vacuum connections will be of ‘ported vacuum’, which changes in an odd way as the throttle is opened. Also make sure that all the factory vacuum lines remain connected (that includes brake booster, charcoal canister, distributor vacuum advance [if fitted] MAP sensor, etc) before starting diagnostics, and the engine should also be up to normal operating temperature. 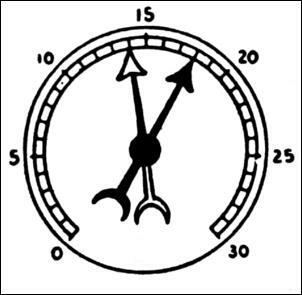 When the engine is healthy and working correctly, at idle the needle of the gauge should be steady and within the range of 17 – 22 inches of mercury. Vacuum should drop to 3 and then momentarily climb to 25 – 28 before settling back at the previous value. This indicates that the valves and rings are OK. The needle will be steady but the reading will be lower than normal. Vacuum will drop to near zero and then momentarily climb to about 22 before settling back to previous value. 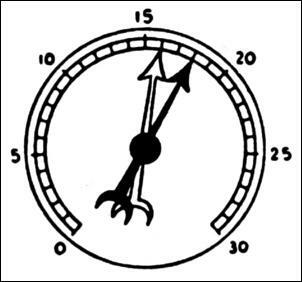 The needle will drop occasionally about 4 inches of mercury from its normal idling reading. The needle will regularly drop by a greater amount than with a sticky valve – eg 6 inches of mercury. 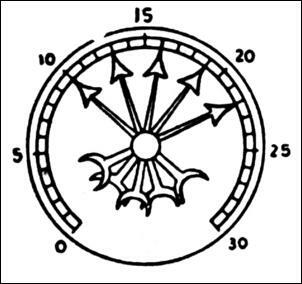 The needle rapidly drops two or more inches each time the valve should be closed. May also indicate a misfire. 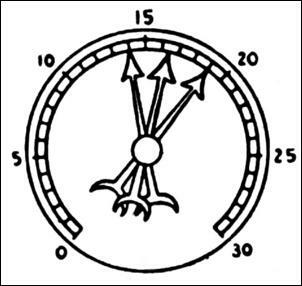 Fast vibration of the needle between 14 and 19 inches of mercury. 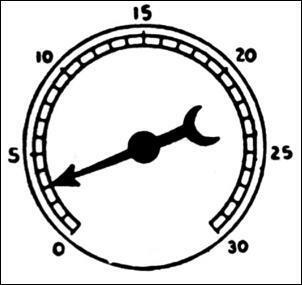 When revving the engine hard, needle varies between 14 – 22 inches of mercury. As rpm increases, a wider variation occurs in needle movement. 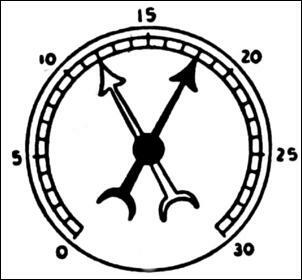 Needle reads low (eg below 5 inches of mercury) at idle. 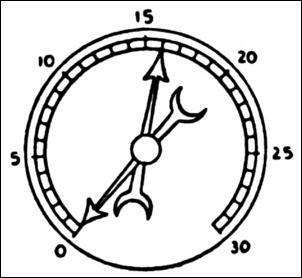 May also indicate late ignition timing or incorrect camshaft timing. Needle floats regularly between 5 and 19 inches of mercury. 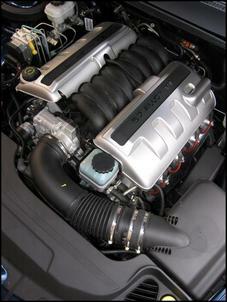 May also indicate intake manifold gasket leak at an intake port or a faulty injector. High reading at first but suddenly returns to zero then builds slowly back to about 16 inches of mercury. 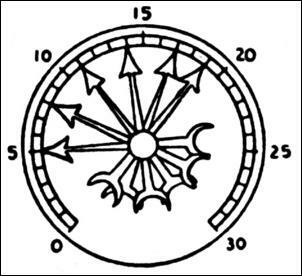 Needle moves slowly through a wide range of readings. Also check idle air/fuel ratio. 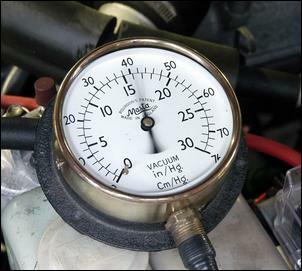 Obviously vacuum gauge readings cannot be definitive, but they can save a you a lot of time and money in chasing down obscure problems. If looking at the absolute readings, it’s important that you remember that the vacuum readings will decrease as your altitude increases. So if you live on top of a mountain, remember to drop 1 inch of vacuum for each 1000 feet you are above sea level. 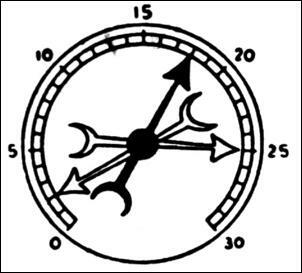 Acknowledgement: The vacuum gauge diagrams used here are drawn from Automotive Service Technology, by Clifford Tempest.